Soviet scientists were the first to fly scientific instrumentation on spacecrafts and satellites. Years of secret preparation and the high payload capacity of the R-7 rocket allowed Soviet scientists to launch a succession of complex scientific missions. Many of these experiments were tested and developed on vertical geophysical rockets. On October 4, 1957, the launch of the first artificial satellite caught the world by surprise. The 83.6 kilogram Sputnik-1 had no advanced scientific instruments, which were not yet ready at that time. Its pressurized spherical capsule contained batteries, a circulation fan and radio transmitters. A 20 MHz transmitter was installed in addition to the 40 MHz Tral telemetry system, in order to study radio propagation and electron density in the ionosphere. The satellite also broadcast standard housekeeping data: onboard temperature and pressure. While it did not contain a micrometeorite microphone sensor, it was thought that a sudden loss of pressure would indicate a meteorite puncture. At this time, little was known about the danger or rarity of such events. The 508.3 kilogram Sputnik-2 was the second man-made satellite, launched November 3 with a number of interesting scientific experiments onboard. A conical protective shell, seen half cut away above, was ejected by a spring-loaded mechanism at the apex of the satellite. The remainder of the vehicle consisted of three modules in a frame: a cylindrical space-radiation unit, a spherical hull (a modified Sputnik-1) containing the radio telemetry system, and a pressurized cabin containing an experimental animal. The first space-radiation detectors onboard a spacecraft included two gas-discharge detectors (Geiger counters), designed by S.N. Vernov. Three photomultiplier tubes were installed by S.L. Mandel'shtam, to study the Lyman-α wavelength of atomic hydrogen and solar X-ray emissions. A wheel of filters included beryllium foil (0.1 - 1 nm), aluminum foil (1 - 2.2 nm), polyethylene (4.4 - 12 nm), lithium fluoride (121.6 nm) and an unfiltered opening. 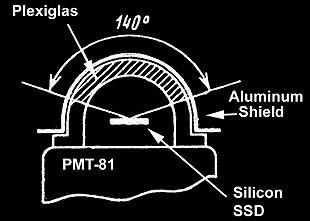 The photomultipliers and filter wheels can be seen above spaced apart by 120°, with the geiger counters and their solid-state electronics spanning two edges of the triangle. The most sophisticated experiment on Sputnik-2 was the life support system and biometric sensors for the dog Laika. The compartment contained an oxygen supply, carbon-dioxide scrubbers, a feeding trough and a waste collecting system. Sensors transmitted electrocardiograms, pulse rate, blood pressure, respiration rate, body temperature, reflex response, and general activity. Some thermal insulation was torn loose by the ejection of the protective shell, and overheating resulted in the premature death of Laika two days after launch. Contrary to some reports, Sputnik-2 did not contain a camera. Originally intended to be the first "artificial earth satellite", Object-D became Sputnik-3. With a length of 3.57 meters, base diameter of 1.73 meters and a weight of 1.327 metric tons, the massive satellite contained a dozen scientific experiments. The size and sophistication of Sputnik-3 surprised the Western technical community as much as Sputnik-1 had surprised the public. Military experts revised their estimates of the lifting power of the R-7, since both the satellite and the second stage of the rocket were boosted into orbit. 12. Solar-Powered Beacon Radio Occultations Ia.L. Al'pert? Sputnik-3 set the bar for scientific instrumentation on spacecrafts. Overseen by M.V. Keldysh, the committee for Object-D worked from 1954, planning and building the scientific experiments onboard the satellite. Many of these experiments became part of a canonical set of sensors installed on virtually every Soviet spacecraft: micrometeorite detectors, cosmic-ray counters, ion traps and magnetometers. As sophisticated as Sputnik-3 was, its operation was hampered by the failure of its onboard tape recorder, and only real-time telemetry over the Soviet Union could be received. The first major discovery of the space age was the existence of Earth's radiation belts, where charged-particle counts increase to 1000 times the normal rate. Geophysicists had suspected their existence since the theoretical work of Carl Størmer in 1906 and simulations with magnetic spheres in vacuum chambers. But this work was not widely known among astronomers, and Explorer-1's first measurements of the belts came as a surprise. An outer radiation belt was first observed by Sputnik-3, and a complete mapping of the Earth's magnetosphere gradually formed as a result of numerous American and Soviet probes. Following the three Sputniks, the Soviet Union continued nonstop, launching hundreds of scientific satellites, including the heavy Spacecraft-Sputniks, the Electron and Proton satellites, and countless Kosmos satellites. Unlike the American program, scientific and military missions sometimes shared the same vehicles. At the beginning of the space age, some scientists were concerned that meteoroids and micrometeoroids could pose a hazard to spacecraft. Sputnik-1 provided the first assurances, as its pressurized hull was not punctured during its three weeks of telemetry transmission. Sensors on Luna-2 Acoustic Micrometeorite Sensor. 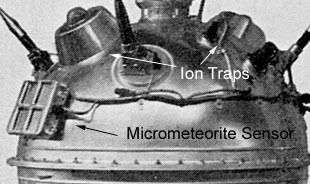 Acoustic micrometeorite detectors were a standard part of nearly every Soviet spacecraft since Sputnik-3. Designed by T.N. 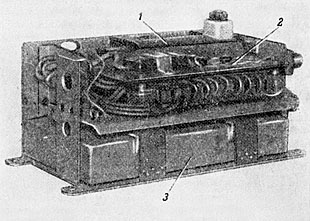 Nazarova, early detectors consisted of a metal plate (1) mounted on flat springs (3). A piezoelectric crystal (ammonium phosphate) was epoxied to the plate to acoustically detect impacts of dust particles. Some were acoustically isolated, and others were coupled to pick up impacts on the spacecraft hull. Impacts proved to be rare (about once a day on a square meter of surface), but during meteor showers this rate can increase by 1000 or more. Deep space probes like Mars-1 and Zond-3 found regions of high dust concentration, also associated with meteor showers and orbits of comets. 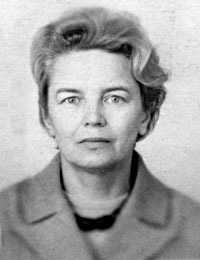 Early spacecraft containing published results from Nazarova's detectors were: Sputnik-3, Luna-1,2,3,10,11,12, Venera-1,2,3 Mars-1, Zond-2,3. Beginning with Mars-1, sensors were attached to the rear of the solar panels, using 1.5 square meters of their area as a detector. Nazarova's micrometeorite detectors were installed on nearly all planetary probes. Magnetometers onboard spacecrafts have been used to measure the orientation of satellites, map the Earth's field, and measure the magnetic fields of other planets. The Earth's magnetic field ranges from 24,000 to 66,000 nanotesla (nT) on its surface. 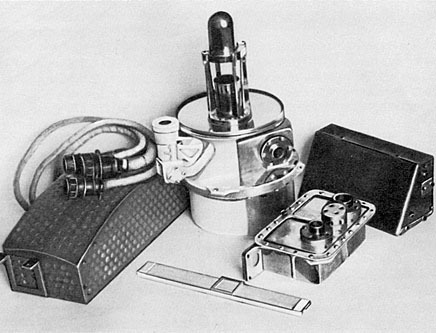 Dolginov designed several types of magnetometers for spacecrafts, including proton precession detectors and variometers. But the most common sensor was the fluxgate magnetometer, which measures a component of the vector field strength in one direction. It is composed of two alternating-current transformers connected in opposite polarity, yielding zero net current. But if an external field is present, nonlinear saturation effects in the iron cores create an imbalance and current is produced. Three perpendicular fluxgates form a triaxial magnetometer, which measures the three-dimensional magnetic vector field. Dolginov's Magnetometers on Luna-1 to Luna-3 discovered that the Moon has almost no field. Luna-2 data suggested a field of less than 50 nT (its dipole field is today known to be zero). Sputnik-3 had the first spacecraft magnetometer, but it was used primarily to measure the satellite's orientation. His devices were included on virtually all Soviet spacecrafts, including Sputnik-3, Luna-1,2,10, Venera-1,2,3, Zond-3, Mars-1 and later missions. Kosmos-26 and 49 were used to make detailed maps of the Earth's field. 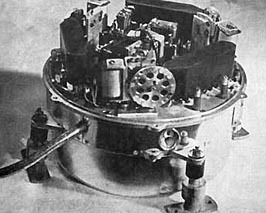 The first planetary probe, Venera-1, had a triaxial fluxgate magnetometer, to measure the field of Venus (if contact had not been lost). It also had two parallel magnetic variometers to measure the magnitude of the faint interplanetary field. Readings from Venera-1 at a distance of 1.9 million km, and from Mars-1 at far greater distances indicated interplanetary fields of 3 to 4 nT. Dolginov's results from the Mars-3 orbiter suggested a weak Martian magnetic field, but recent measurements suggest it is from solar wind, not the planet's core. The Solar Wind was the second major space-science discovery (after the Van Allen belts). The controversial theoretical prediction of E.N. Parker was first confirmed by Luna-2. The vacuum of interplanetary space actually contains faint traces of electrons, protons and other ions. The quantity of this plasma is measured by amplifying the faint electric current that results when it passes through an electric field between an inner tungsten grid and a nickel collector plate. To get information about the energy spectrum, an outer nickel grid could be charged to repel ions below a threshold kinetic energy. Sputnik-3 carried spherical ion traps on the end of two booms, designed by K.I. Gringauz. These varied grid voltage to return "retardation spectra" of plasma energy. In 1959, Luna-1 to Luna-3 had four hemispherical ion traps with outer grid voltages set from -10 to +15. The presence of a uniform plasma wind of about 400 km/sec was indicated by periodic readings as the probe rotated. This was first observed on Luna-1, and Gringauz made improvements to confirm the solar wind with Luna-2 (e.g., changing the design and arrangement of traps, from coplanar to tetrahedral). In 1961, Venera-1 carried two ion traps on its sunward side, with outer grid voltages of 0 and +50. Data from the three successful telemetry downloads verified the solar wind's existence to a distance of 1.9 million km. Mars-1 verified the solar wind to a distance of over 100 million km. Gringauz' ion traps were on nearly every Soviet planetary probe and numerous satellites. Mars-1 and later probes also carried flat modulation traps, which could measure the energy spectrum of solar plasma, from 0 to 3600 eV, by sweeping a range of retardation potentials. Hemispherical and modulation traps were typically mounted on the side of the orbital module, below the astrosensor dome. More sophisticated devices were deployed to measure the direction and energy spectrum of the interplanetary plasma. Electrostatic analyzers were first flown on the Elektron satellites, and compound plasma spectrometers were included on later spacecraft like Venera-11. Cosmic rays were discovered in 1912, but only secondary collision products reach the Earth's surface. Soviet scientists were among the first to study primary cosmic rays in the 1930s, using high altitude balloons. Low energy particles come from the Sun's corona, while higher energy "galactic" rays are believed to originate in supernova explosions. Gas-discharge tubes (Geiger-Müller) detect all ionizing radiation, including gamma rays and high-energy charged particles. They are usually filled with an easily-ionized noble gas, with some halogen to quench continuous discharging. A high voltage field is maintained between the metal walls of the tube and a central filament. The passage of a ray creates a trail of ions in the tube, which are swept up by the electric field, creating a small pulse of electric current. 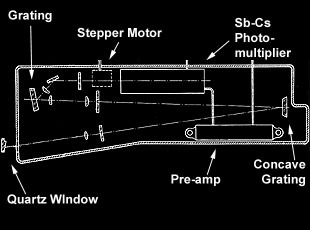 Vernov and his associates frequently used the STS-5 gas-discharge tube, which was 9 × 1 cm. 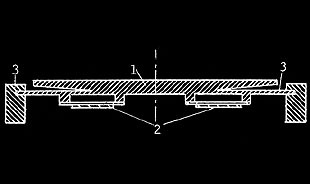 These were typically mounted on the inner hull of the spacecraft, providing about 1 gram per square centimeter of aluminum shielding to discriminate high energy protons. 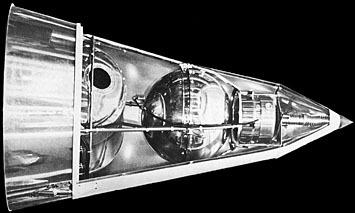 The SBT-9 end-window tube was sometimes used, mounted outside the spacecraft to measure lower energy protons and electrons. More compact spacecrafts, like the Luna-9 lander, might use the miniature 0.6 × 1 cm SBM-10 tube. In the scintillation counter, radiation striking a crystal of sodium iodide (NaI) or cesium iodide (CsI) causes a flash of light, measured by a photomultiplier tube. Zinc Sulphide (ZnS) scintillators were used to measure low-energy electrons. 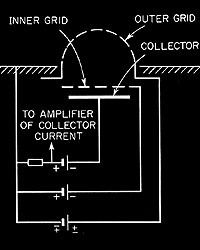 Scintillators have many excellent qualities, but they are heavy and require high-voltage power supplies. Only the Soviet Union routinely carried them into space, on their massive spacecrafts. In the mid 1960s, scintillation counters were generally replaced with silicon solid-state detectors, which were small and could be mounted outside the vehicle, often on the Solar and anti-Solar sides of the spacecraft for comparisons. S.N. Vernov and his associates at Moscow State University played a major role in the design of these devices. 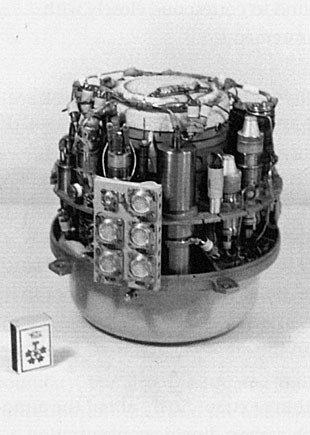 Detectors were typically clustered, as in the KS-18 unit seen above. Scintillators and gas-discharge detectors respond in different ways to charge and energy, and shielding can be used to discriminate particle energies. The KS-18 consists of a scintillation counter (1), two STS-5 gas-discharge tubes (2,3) and a solid-state electronics to amplify and count events (4). Luna-2 contained a CsI and two NaI scintillation counters, and six gas-discharge tubes shielded with different thickness of copper or lead. 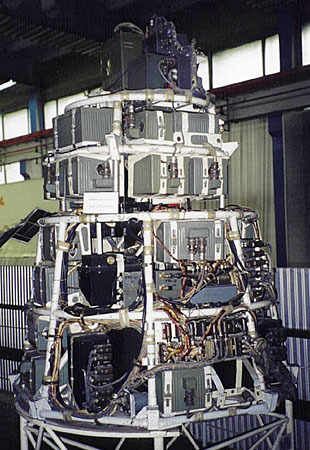 Mars-2 contained 11 detectors, including a Cherenkov counter, four gas discharge detectors and seven silicon solid-state detectors. Cosmic rays striking the body of the spacecraft can produce a shower of secondary particles, interfering with the measurement of primary radiation. In 1964, Zond-1 carried the L-1A sensor, an STS-5 gas-discharge tube surrounded by an anti-coincidence shield of seven tubes. The device was also included in the 2MV and 3MV Mars and Venus (Zond-1, Venera-3) landing capsules. Charged particles create a trail of ionization, setting off the center tube and some of the surrounding shield tubes. An event in the center tube with no shield-tube signal indicates a gamma ray, which is absorbed at a single point. Used in flight, the device was contained in the landing capsule to measure the total amount of potassium, uranium and thorium in a planetary crust. In 1962, A.I. Lebedinskii and V.A. Krasnopol'skii built the DAS-1 anti-coincidence counter for the 2MV Venus lander (in addition to the L-1A). 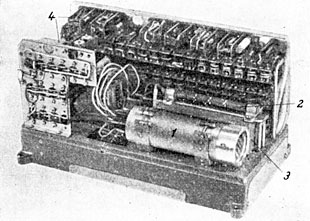 It contained a 3×3 array of gas-discharge tubes, with the center detector actively shielded by the surrounding 8. The unit contained a circuit which alternately counted gamma-ray events from this detector and motion-changing events from a mercury switch. The latter device was installed to detect rocking frequency in the event of a hypothetical ocean landing on Venus. 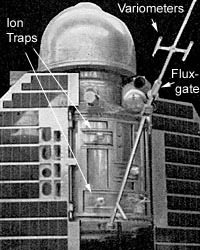 On 3MV landers the DAS-2 replaced the gamma detector with a photometer, and the L-1A remained for gamma-ray measurements. 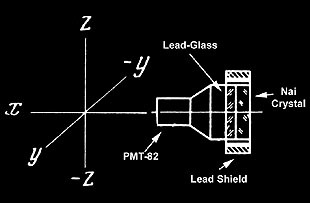 Cherenkov radiation results when particles pass through a transparent medium (plexiglas) at relativistic speed. A wake of light is created, similar to a sonic boom, because the particle is traveling faster than the speed of light in that medium (Soviet physicist Pavel A. Cherenkov was awarded the Nobel Prize for this discovery). Cherenkov detectors use a photomultiplier tube to detect this light. Because this radiation increases with the square of the particle's charge, these detectors are especially useful for studying heavy-nuclei cosmic rays, and they do not respond at all to photons (gamma radiation). The detector installed on Sputnik-3 and Luna-1 to 3 is seen above. Cherenkov detectors were installed on Mars-1-7 and Venera-9,10 and other spacecrafts. The proton telescope on Venera-11 used a thick hemisphere of plexiglas as a Cherenkov detector. An aluminum shield kept out electrons. Higher energy protons produce a stronger signal, but so also do protons that travel through a longer length of plastic. To reduce the variation in path length, a solid state detector is placed at the center, and a coincidence detector records only particles that strike both the Cherenkov detector and the SSD. This limits the events to ones entering perpendicular to the plexiglas hemisphere. When one particle triggers two different styles of detector, one can solve for two unknown quantities: the charge and energy. Soviet scientists S.N. Vernov and A.E. Chudakov pioneered the use of gas discharge detectors combined with crystal scintillator or Cherenkov detectors. The latter devices required high-voltage power supplies and photomultiplier tubes and were too heavy to be carried by the first American satellites and probes. Vernov and Chudakov were the first to measure the makeup and energy spectra of the Earth's radiation belts and the first to detect the outer radiation belt. Called the "Van Allen-Vernov belts" in Russian literature, Soviet discoveries have rarely been acknowledged by Western scientists. It is particularly difficult to study far ultraviolet, X-ray and gamma-ray radiation from within the atmosphere, which is highly opaque to these wavelengths. Satellites and spacecrafts opened up whole new windows of astronomical study. One of the most interesting wavelengths of the electromagnetic spectrum is the Lyman-α line, the fundamental "color" of atomic hydrogen. This is a far ultraviolet wavelength of 121.567 nanometers. Sputnik-2 carried a detector that included a lithium fluoride filter for this wavelength, and one including a calcium fluoride filter for the atomic-oxygen wavelength. V.G. Kurt supervised a series of Lyman-α photometers on sounding rockets and numerous spacecraft, including Zond-1 and Venera-2,3,4 and Mars probes. These detectors used a lithium fluoride lens and a Geiger-Müller tube filled with nitric oxide, surrounded by anti-coincidence shielding against cosmic rays. An hydrogen cell acts as an ultra-narrow-band shutter to obtain differential measurements. It is activated by turning on a hot filament which generates atomic hydrogen from molecular hydrogen. Later versions (e.g. Venera-9) included cells of hydrogen (pure protium isotope) and deuterium. Venera-4 discovered a hydrogen corona around Venus, as solar radiation blasted away lighter gases in its atmosphere. Solar X-rays and hard UV-radiation has been studied by Soviet spacecraft since Sputnik-2. Since hard radiation is difficult to refract or diffract, telescopes and spectrometers have been a challenge. S.L. 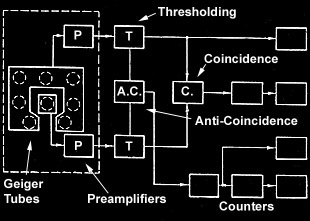 Mandel'shtam used filter banks and photomultiplier tubes. Diffraction by crystal lattice has also been used to study x-ray spectra. Mandel'shtam installed a Solar x-ray/UV sensors on the 3MV-1A and 3MV-4A planetary test vehicles, but all were lost in launch mishaps. In the 1980s, the Astron and Granat orbiting x-ray and ultraviolet telescopes functioned for many years. 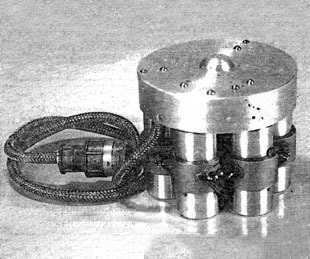 The anti-coincidence counters carried carried by Zond-1 and Venera-3 (described above) were used in flight to measure primary cosmic-ray protons, but their main purpose was to measure gamma-ray emissions from the surface of Venus and Mars (a model 3MV Mars lander was never sent). In the early 1970s, galactic gamma-ray bursts were observed by American and Soviet satellites, deployed to monitor nuclear-weapons testing. The Konus gamma-ray detectors were first carried on Venera-11 and Venera-12, as well as a Prognoz satellite, to triangulate on the source of these rare events. Over 140 gamma bursts were recorded, and the experiment was repeated by Venera-13 and 14. 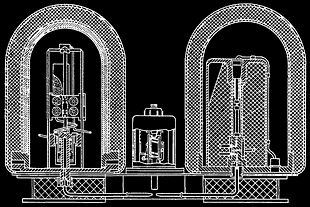 The Konas apparatus consisted of 6 perpendicular, directional gamma-ray detectors, consisting of shielded NaI scintillation counters. V.G. Kurt played an important role in Astron, Granat and Konus experiments. Gamma radiation has also been used to study the surface minerals of planets. The rock density can be measured by the back scatter of gamma rays from a radioisotope source. The use of this technique was pioneered by A.L. Kemurdzhian, I.I. Cherkasov and others, with the Luna-13 lander. The Mars-3 lander contained a gamma-ray densitometer on a small tethered rover (but the lander failed shortly after touchdown), and Venera-9 and 10 deployed one on the end of a long boom. Three natural elements are radioactive: uranium, thorium and potassium. A gamma-ray spectrometer uses a scintillation counter and forms a histogram of counts in different energy ranges. Each element emits a gamma ray of a particular wavelength, and the abundances of K,U,Th is known for common rocks and minerals. This technique was employed by Iu.A. Surkov on many Soviet spacecrafts. Since it has no atmosphere to block the rays, the gamma spectrum of the Moon was measured from Earth satellites (Kosmos-60) and from Luna-10, the first Lunar satellite. 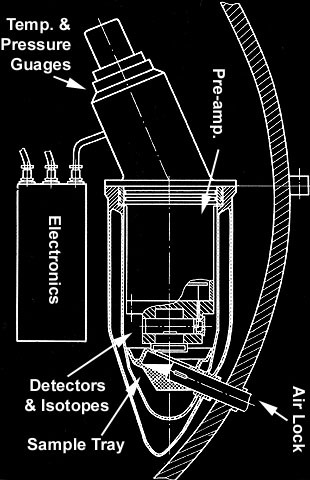 The Kosmos-60 detector consisted of a CsI scintillator surrounded by a plexiglas Cherenkov counter. The Scintillator responds to both gamma rays and charged particles (cosmic rays), while the Cherenkov counter only responds to charged particles and acts as an anti-coincidence shield. Mars was also analyzed by the Mars-3 and Mars-5 orbiters, compensating for the thin atmosphere. Seen above, the Venera gamma-ray spectrometer used a CsI scintillator with FEU-118 photomultiplier tube. The surface of Venus was analyzed at several locations by Venera-8,9,10 and Vega-1,2. Most readings have indicated a basalt-like volcanic rock, but Venera-8 readings appeared more like granite. Venus and Mars landing capsules contained instruments to measure the altitude profile and surface values of the atmosphere's physical properties. The outer atmosphere of a planet might also be monitored with devices to measure extremely rarified gases, as first done by Sputnik-3. In addition, spacecrafts and satellites contained housekeeping sensors to monitor internal temperature and pressure. Venera landers carried platinum wire resistance thermometers, enameled to resist chemical corrosion, absorption of gas into metal or even the effects of immersion in liquid. The electrical resistance of a spool of fine (0.05 mm) wire would increase with temperature; for example, from 27 to 85 Ω in a range of temperature from -50° to 400° C. This was measured with an AC balanced bridge circuit and stabilized amplifier. The enameling of the thermometer was important; bare platinum-wire thermometers on the American Pioneer Venus probes all shorted out in the lower atmosphere, as the result of being coated with an unknown conducting substance. Pressure measurements span the range from the near vacuum of the ionosphere and exosphere of planets to the almost 100-atmosphere pressure of the surface of Venus. No single instrument can handle that range. Higher pressures are measured with a battery of aneroid and capacitor barometers that measure pressure in different ranges. More rarified atmospheres are measured with hot-wire (Pirani) gauges, which measure the rate at which heat is carried away by gas conduction. Extremely low pressures (such as the Sputnik-3 sensors) are measured with ionization gauges, using hot cathodes or cold cathodes. The latter are often called "magnetic pressure gauges" in early Soviet literature. The early Venera landers measured density directly. The Venera-4 sensor was an ionization chamber, coated on the inside with 1-millicurie of Strontium-90, it measured the minute electric current from ions swept up by an electric field. One of the thermometers and a densitometer were integrated in the unit shown above. It provided information at higher altitudes, in a density range of 0.0005 to 0.015 g/cc with a 1.5% error. Venera-5 and 6 used a 160 Hz tuning-fork densitometer with a range of 0.0005 to 0.040 g/cc and 3% error. Atmospheric density was also measured by onboard accelerometers and radio Doppler measurement of the descent capsule's velocity. V.V. Mikhnevich designed and built the early P,T,ρ sensors, from Sputnik-3 to Venera-4. Her skill as a builder of precision instrumentation has been remarked on by colleagues. 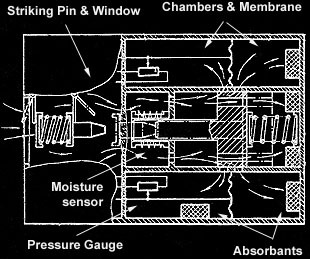 Later missions and landers contained pressure and temperature sensors built by Lavochkin engineers, with resulting data and analysis published by V.S. Avduevskii and M.Ia. Marov. Infrared sensors and spectrometers have been used on Soviet planetary missions to investigate molecular spectral lines, the thermal balance of planets, and to measure altitude by atmospheric depth. In 1956, American astronomer William Sinton observed infrared absorption bands from Mars at 3.45,3.58 and 3.69 μm. These are in the range of vibrational frequencies of the C-H bond in organic molecules, which on Earth are produced only by biological processes. On Mars, they were thought to correspond with dark regions of possible vegetation. In 1963, two of the "Sinton bands" were explained by effects in the Terrestrial or Martian atmosphere. It was clearly important to observing these bands from space and correlate readings with features on the Martian surface. 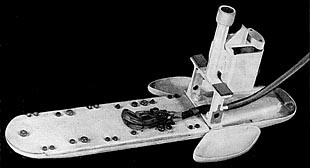 The first Soviet Mars attempt in 1960 was to carry a CH-band sensor, but it and the camera were removed to reduce weight. Subsequent Mars-1 and Zond-2 missions were launched with these sensors. A.I. Lebedinskii designed the IR spectrometer to measure the spectrum of Mars from 2.4 to 4.1 μm. It consists of cassegrain optics, a mechanically scanning diffraction grating and a lead sulphide (PbS) detector cooled to -78° C by exposure to space. The spectrometer is seen above, flanked by boxes containing internally mounted electronics and externally mounted preamplifiers. It looked coaxially with the Mars-1 and Zond-2 cameras, mounted outside the special instrument module, and a small photometer mounted on the side of the spectrometer provided a reference reading at visible wavelengths. This is Lebedinskii's "Martian Life Detection" experiment, which rocket engineer Boris Chertok criticizes in his book and in an interview on the BBC's Planets program. However, the design and scientific motivation of the device are perfectly sound, and it operated successfully in later testing onboard Zond-3. A similar experiment was carried out years later by the American Mariner-6 mission. What actually transpired between Chertok and Lebedinskii may have been a misunderstanding or a conflict of strong personalities. 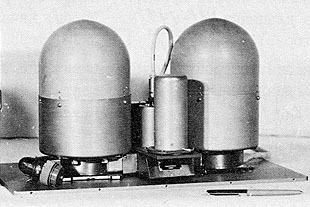 Mars-3 contained IR photometers designed by V.I. Moroz to measure absorption bands of water and carbon dioxide and the planets brightness temperature. The narrow-band carbon dioxide photometer measured altitude of terrain from the thickness of the atmosphere. In 2004, V.A. 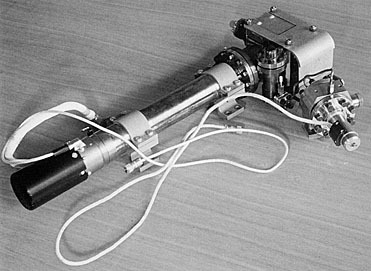 Krasnopol'skii, who worked with Lebedinskii in the 1960s, completed the long Russian quest to detect methane on Mars. For Venus, Lebedinskii designed an spectrometer to measure the thermal radiation of the atmosphere and surface. It consisted of two spectrometers, measuring the ranges from 7 to 20 μm and 14 to 38 μm, each at 150 positions. 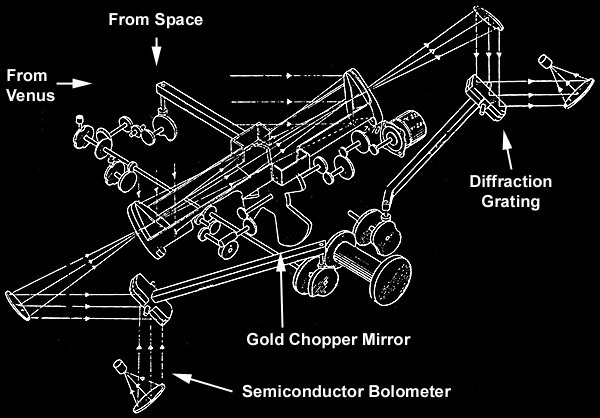 A two-sided gold chopper mirror alternately exposed the spectrometers to Venus or to deep space, so a differential signal could be measured. The detectors were semiconductor bolometers (sensitive thermometers). 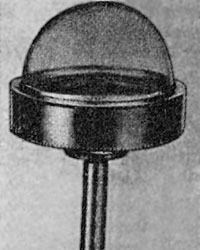 To eliminate wavelengths outside the range of interest, the first spectrometer contained an indium antimonide window, and the second used a lithium fluoride mirror. The device shown above was flown onboard Venera-2 in 1965. 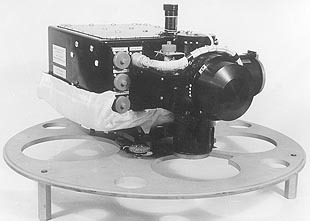 Like the Martian IR spectrometer, it was located outboard, attached to the side of the special instrument module, a 13-15 kg unit about 50 cm in size. It was oriented coaxially with the camera and also contained a coaxial photometer for a visible-light reference signal. Programmed by shaped cams, the device was designed to make a spectral scan of the range of wavelengths, and then perform a spatial scan along the disk of the planet at fixed wavelengths (9.5 and 18.5 μm). The spectrometer was successfully tested on Earth orbiting satellites, but the Venera-2 spacecraft failed shortly before planetary encounter. It is believed that Venera-1 contained an IR radiometer, probably designed by Lebedinkskii. 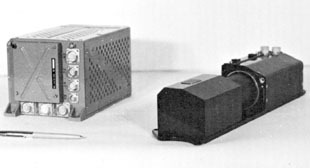 The 1962 2MV photo-flyby attempt (which was stranded in parking orbit) also contained an IR sensor, either a radiometer or an earlier version of his spectrometer. The Venera-9,10 orbiters studied the gas absorption bands in 1.6 to 2.8 μm with a circular-ramp interference filter. That device made high resolution spatial scans across the disk of the planet, providing information about the makeup and structure of clouds. These cross-planet scans were augmented by data from two horn radiometers (8-13 μm and 18-28 μm), spectral regions relatively transparent to carbon dioxide. Mariner-2 and Mariner-10 made broadband IR radiometer measurements of Venus, and the Pioneer Venus orbiter took readings through a wheel of 10 IR filters. 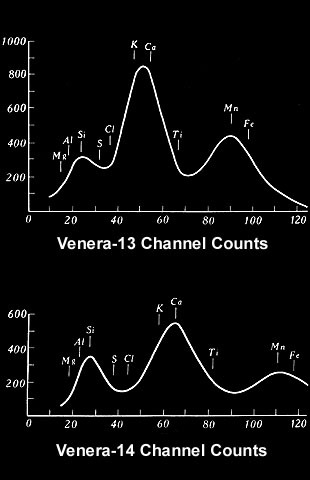 In 1983 and 84, the most complete infrared spectral data for Venus was measured using Fourier spectrometers on Venera-15 and 16. This measured a 256-point spectrum in the range of 6 to 36 μm, sampling about 60 points per orbital pass over the north polar region. The device was built by Dieter Oertel's team at the Berlin Space Research Institute in East Germany. 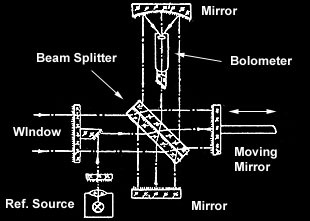 A Fourier-transform spectrometer uses a beam splitter and mirrors to mix the incoming light with itself and produce constructive or destructive interference depending on wavelength. By moving one mirror and changing the path length, varying interference is measured, which happens to measure the Fourier transform of the IR spectrum. This elegantly simple idea was realized in the 19th century, but was useless before the invention of computers and efficient algorithms for inverting the Fourier transform. The Venera-15 spectrometer identified carbon dioxide, water vapor, sulphuric acid and sulphur dioxide. A strong carbon-dioxide band was used to measure the altitude profile of temperature. An interesting result was the variation of spectra across the north pole, indicating complex atmosphere structure in the region. Ultraviolet spectrometers have been used to study the atmosphere of planets from space and from descent vehicles. Spectra can reveal information about the chemical makeup, and the penetration of ultraviolet radiation is relevant to models of atmospheric photochemistry. Lebedinskii and Krasnopol'skii designed a far-ultraviolet diffraction-grating spectrometer, seen above, to measure 190 to 275 nanometers in 150 steps. The spectrum was measured by a photomultiplier tube and transmitted digitally. They also built a diffraction-grating spectrograph to measured the 285 to 355 nm UV range. It projected the spectrum onto film via a special window on the Zond-2,3 and Venera-2 camera system. 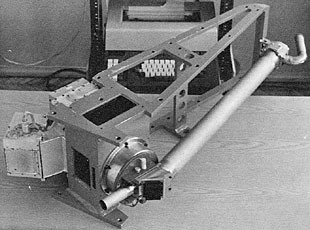 A similar UV spectrograph was installed with the Mars-1 camera. These spectrographs were then scanned and transmitted along with the planetary images. 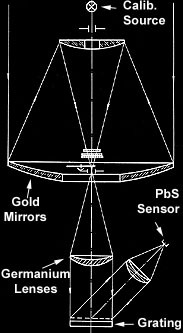 Later Mars and Venus missions contained ultraviolet photometers which were used to measure spatial profiles across the disk of the planets. In 1975, Venera-9 and 10 returned scans at 352 and 345 nm with 16 arc-seconds of spatial resolution. Similar devices on the 1973 Mars-5 orbiter measured 260 and 280 nm. As with IR scans, these UV measurements were used to study the structure of the atmosphere, clouds and ozone layers. Some of these devices sent to Mars and Venus were also tested on Soviet meteorological satellites. Venera-13 and 14 descent vehicles carried gallium phosphide photometers and the penetration of radiation in the range of 320 to 390 nm. The Vega mission landed two vehicles on the night side of Venus. During descent, atmospheric gasses flowed through the long pipe seen above, and ultraviolet light from a Xenon lamp was passed through it. A 512-point absorption spectrum from 230 to 400 nm was measured using a diffraction grating and an integrated linear array of photodiodes. Earth-based spectrometers and camera systems provide most of the information about the outward appearance of planets in the visible spectrum. However, photometers and spectrometers on descent vehicles provided important information about cloud structure, chemical absorption lines and the spectral radiation balance on Venus. Prior to Venera-8, landers targeted the night side, but some contained photometers to detect airglow or lightning. Zond-1 and Venera-3 contained photometers built by A.I. Lebedinskii and V.A. Krasnopol'skii. Landing on the night side of the planet, these sensors were meant to detect airglow. They were sensitive to a wide range from 0.001 - 100,000 lux, encoding their output logarithmically. 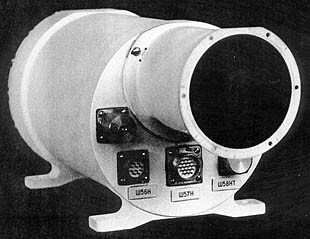 The unit also included a mercury level sensor, similar to the one used on 2MV landers, to detect rocking motion in the event of a water landing. Venera-5,6 also contained photometers to detect nightside airglow. One bright signal was returned by Venera-5, which may have been a lightning flash. These devices were built by A.P. Ekonomov and B.E. Moshkin. V.I. Moroz designed a series of spectrometers for Venus and Mars descent vehicles. Venera-8 contained a redundant pair of IOV-72 photometers, cadmium-sulphide photoresistors sensitive to the visible range of 400 to 800 nm. These reported radiance levels and photoresistor temperature from 50 km to ground level. This device, seen above, was contained in an insulating container packed with heat-absorbing lithium nitrate trihydrate. Venera-9 and 10 contained an improved model, the IOV-75, which used three fiber-optic pipes to view upward (narrow and wide angles) and downward. A wheel of five glass filters provided color and radiance measurements at wavelengths between 440 and 1160 nm (green, yellow, red, IR1, IR2). It was correctly assumed that blue light would be extinguished by Rayleigh scattering. This instrument, along with Marov's nephelometers, revealed for the first time that the Venusian clouds consist of three layers. In 1978, Venera-11 and 12 contained the more advanced IOAV, a combined scanning photometer and spectrometer. The scanning photometer used a 360° rotating prism mounted on the aerobrake to scan from zenith to nadir. This light passed through an inner ring of four color filters on a rotating filter wheel (green, red, IR1, IR2). 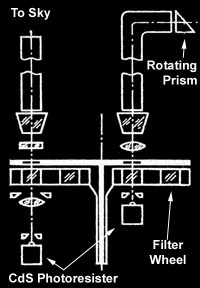 The spectrometer measured the zenith sky radiance throught an outer ring on the filter wheel, containing a ramp interference filter. This measured a spectrum from 430 to 1170 nm with a resolution of about 20 nm. In 1981, Venera-13 and 14 carried the IOAV-2, which measured full spectra (470-1200 nm) from a wide-angle sky view and six narrow-angle directional views. Planetary spectroscopy was also done onboard orbiting spacecraft. After Venera-3 and the untimely death of Lebedinskii, Keldysh created the Space Research Institute (IKI) and reorganized the responsibilites for scientific instrumentation. The astronomer and spectroscopist, V.I. 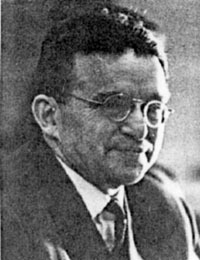 Moroz headed the development of IR, UV and Visible spectroscopy. He was joined by V.A. Krasnopol'skii (who had worked with Lebedinskii), L.V. Ksanfomaliti, A.P. Ekonomov and B.E. Moshkin. Moroz, Krasnopol'skii and Ksanfomaliti designed three generations of orbital instruments for the 1971 Mars orbiters, 1973 Mars orbiters and 1975 Venus orbiters. Mars-2 and Mars-3 carried IR, Visible and UV spectrometers, including specialized instruments for measuring water vapor and for measuring the depth of the atmosphere from carbon dioxide absorption spectra. In 1973, the Mars-5 orbiter contained an important innovation, the first photopolarimeter onboard a planetary probe. 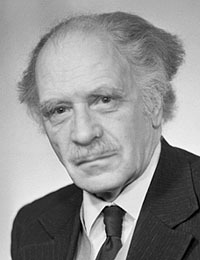 The measurement and analysis of polarization was pioneered by French astronomer Audouin Dollfus, who joined Ksanfomaliti and redesigned his optical photometer to measure polarization through seven different color filters. This instrument yielded new information about high altitude haze layers in the atmosphere and about the size and shape of dust and sand grains on the surface. A third version of this instrument was flown on the Venera-9 and Venera-10 orbiters in 1975. Spectrometry can identify some chemicals in a planet's atmosphere, but it is often difficult to know the percentage. In the first few Venus probes, Soviet scientists considered several approaches but decided to begin with simple and robust automatic chemical analysis of the major components: carbon dioxide, nitrogen, water vapor, and oxygen. K.P. Florenskii and his associate B.M. Andreichikov designed and built several types of chemical analysis units for the Zond-1 and Venera-3 missions. 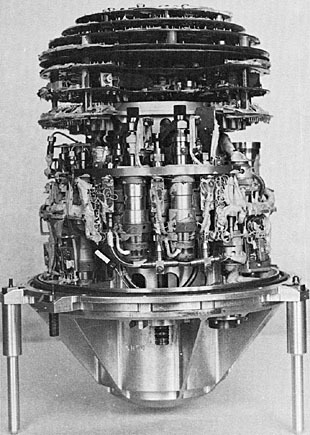 In 1967, the analyzer units were placed onboard Venera-4 and provided the first in situ analysis of the atmosphere. Earlier units were onboard unsuccessful Venus and Mars missions in 1962, but very little is known about their design. 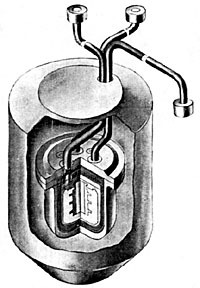 Manometers were used to measure abundant gases. The G-8 unit, seen above, contained five manometer analysis cells, a moisture gauge and control electronics in a 10 cm diameter cylindrical package. At a predetermined time after probe activation, a glass window was broken, the cells filled with atmospheric gas, and then were sealed again. On one or both sides of a membrane dividing a cell, specific chemicals absorbed particular atmospheric gases, and a pressure difference was measured. For example, potassium hydroxide (KOH) absorbs carbon dioxide and water vapor, calcium chloride (CaCl) absorbs water vapor, so the pressure difference measures carbon dioxide. A zirconium wire, heated to ignition, absorbs oxygen, carbon dioxide and nitrogen (zirconium will burn even in pure nitrogen). White phosphorus was used to react specifically with oxygen, but the resulting oxide also absorbs water. 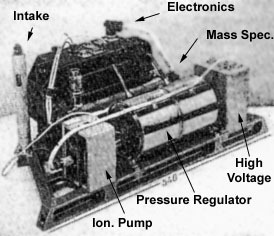 A second analysis unit, the G-10, contained two manometers and three miscellaneous experiments designed to detect trace amounts of gases. In the case of oxygen and water vapor, it was not initially known if the amounts would be small or large, so both manometer and small-trace experiments were devoted. For example, measuring the electrical conductivity of a moisture absorbing film (phosphorus pentoxide) was well suited to dry atmospheres with just a trace of water. This unit may have been a consolidation of several separate experiments designed for Zond-1 and Venera-3. The G-9 unit, planned for use on Mars, was probably never built, since no model 3MV Mars landing missions were ever launched. Before Venera-4, little was known about the abundance of major gases, so these experiments were designed to deal with many possibilities. Some would return an indication that a threshold was exceeded. Some indicated the amount of a gas, within some working dynamic range. The analysis units on Venera-5 and 6 were redesigned to more accurately measure within the known ranges of abundance. With water and ice ruled out as cloud materials, theories of ammonium compounds were briefly popular. For this reason, Venera-8 contained a sensor to measure ammonia by color change of a specialized indicator (tetrabromine-phenolsulphaphtalein). This turns dark blue in the presence of ammonia, and indicated 0.1 to 0.01 percent; however, it was later discovered that concentrated sulphuric acid turns this indicator dark red. It is currently believed that ammonia is 10 to 1000 times more scarce than the Venera-8 reading. An interesting and difficult question has been the amount of water vapor in the atmosphere of Venus. Venera-4 first indicated the extreme dryness of that world and cast doubt on theories that the clouds were made of water droplets or ice crystals. In the modern theory of sulphuric-acid clouds, water vapor is critically important. Sulphuric acid forms from sulphur trioxide combining with water, and because this acid is hydroscopic, it absorb additional water to form droplets of about 70 percent concentration. Unfortunately, the numerous measurements of water vapor have not all been consistent. The Vega landers carried carefully designed devices to measure water vapor by two methods. Both were held inside insulated domes, temperature stabilized with a heat-absorbing phase-change material (lithium nitrate trihydrate). The right dome carried an electroconductivity sensor based on the moisture absorbing salt lithium chloride. A similar experiment was carried by Venera-13 and 14, but not as well stabilized in temperature. The left dome carried a thermoelectrolytic sensor that detected hydrogen gas generated by electrolysis of another moisture-absorbing material. Results indicated 0.1 to 0.2 percent water vapor in the upper atmosphere (around 50 km) and drier conditions at lower levels. In addition to direct chemical analysis, Soviet probes used a variety of other techniques to determine the makeup of planetary atmospheres. 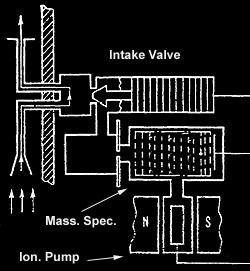 The mass spectrometer measures mass divided by charge (m/z) for ionized atoms and molecules. 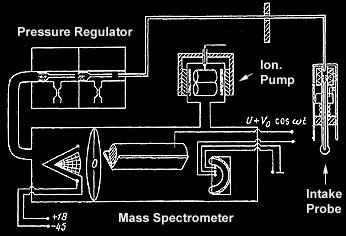 Mass spectrometers are best used to measure the absolute amount of chemically inert nitrogen and noble gases, or to measure the ratio of isotopes of any element. Isotope ratios of inert gases shed light on theories of nuclear synthesis of elements and indicate age via radioactive dating. For example, Argon 40 is largely the product of the slow decay of radioactive potassium. Sputnik-3 and earlier Soviet geophysical rockets carried the first mass spectrometers into space. Light-weight radio-frequency spectrometers were favored, and credited to the colorful American inventor William Bennett. These operate in a high vacuum maintained by an ion-sputter pump. They take in an extremely minute sample of gas, which is ionized, passed through a mass-over-charge discriminator, and detected by a sensitive electron multiplier. The discriminator contains an oscillating electric field, and only ions of a particular m/z will pass in a stable spiraling trajectory, without colliding with the walls. The first mass spectrometers on Venus were onboard Venera-9 and 10. 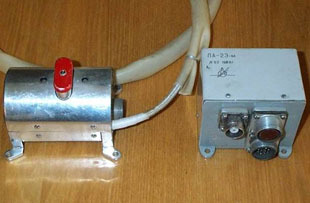 These were model P-11 devices built by the Low-Temperature Institute in Kiev and the Vernadskii Institute. A pressure regulator was designed to handle input pressures from 0.1 to 10 atmospheres. The gas sample was ionized between a cold cathode and a conical tungsten screen. These devices may have detected carbonyl sulphide (COS), but the results were inconsistant with later mass spectra. it is believed they had problems with the gas intake or pressure regulators. Following Venera-9 and 10, seven more mass spectrometers of increasing sophistication and accuracy were deployed to Venus. One was onboard the Pioneer Venus, and produced useful data despite the micro-pore intakes being plugged by cloud droplets between 50 km to 28 km, where the droplets boiled away. A few days later, Venera-11 and 12 deployed model MKh-6411 mass spectrometers developed by V.G. Istomin. To avoid the problem of clogged micro-pore intakes, a pulsed piezoelectric valve opened a relatively large hole for a brief instant. They also avoided the cloud layer by switching on at an altitude of 25 km. The batch of gas was then analyzed in a series of 8 second frequency sweeps, and the device pumped down to hard vacuum for a while before processing the next sample. Taking advantage of Venera's telemetry relay through the bus's high-gain antenna, a mass-spectrometer data rate 100 times greater than the Pioneer Venus large probe's was available. 176 full spectra were transmitted from 22 gas samples during the descent to the surface. 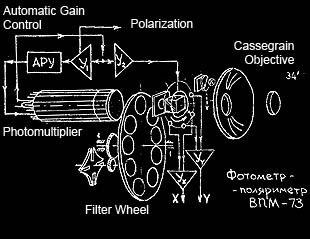 Istomin placed earlier models of his mass spectrometer on the Mars-3 and Mars-6 landers, which unfortunately were not able to transmit significant telemetry. Chemically reactive gases are difficult for mass spectrometers because they can stick to the walls of the instrument. Gas Chromatography takes advantage of this effect, driving a sample of gas through a long column of porous material to separate materials by their differing "stickiness". Chromatography was invented in 1903 by the Russian biochemist Mikhail Semenovich Tsvet. He coined the name chromatography, and it is amusing to note that his name, Tsvet, is also the Russian word for color. The "Sigma" chromatographs designed by L.M. Mukhin and B.G. 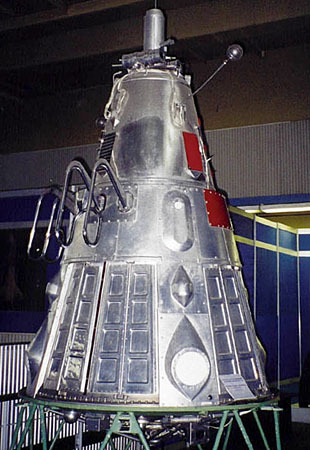 Gel'man were carried by Venera-11 and 12 in 1978. These used ultrapurified neon to drive a sample of atmospheric gas through 5.5 meters of porous materials. As the separated sample emerged, the presence of foreign atoms was detected by the changed ionization rate of neon (the Penning effect). Shortly before planetary encounter, the system flushed with neon for 4 hours, then performed 8 analyses of the atmosphere between 42 km and touchdown on the surface. In 1981, an improved "Sigma 2" was able to detect many additional chemicals in addition to those found by Venera-11. It was also able to begin functioning within the cloud layer. 15 analyses were performed between 58 km and the surface of Venus. While chromatography is not always quantitatively accurate, it can be a sensitive detector of substances. It complements mass spectroscopy by resolving chemically reactive gases, and it provides an independent check, with different types of ambiguity. For example, a mass spectrometer may not be able to differentiate O+ from S++ ions, since they have the same mass over charge. Mukhin's chromatograph discovered an unexpected peak which could be sulphur hexafluoride or nitreous oxide. Both have the same retention time, but detector sensitivity (ionization rate) ruled out the second, which would have required an unrealistically high abundance. The Vega missions focused attention on the analysis of the cloud droplets of Venus. 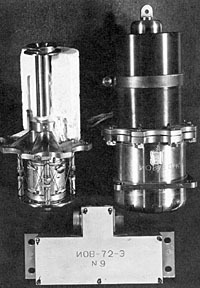 The "Sigma 3" chromatograph was designed to capture cloud aerosol in a filter and then vaporize the material for analysis. 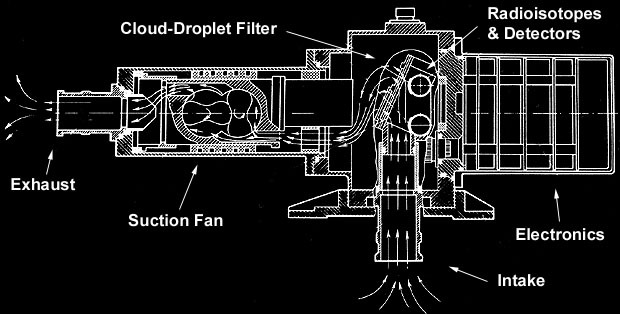 Soviet landers on Venus used x-ray fluorescence spectroscopy to analyze surface rocks and cloud droplets. Gamma rays or alpha particles are used to knock electrons out of the inner shells of atoms. An outer electron drops into the vacant position, and an x-ray photon is emitted. It's energy increases with atomic number (Z). Venera-12,14 and Vega-1,2 carried spectrometers designed to analyze the makeup of the Venusian clouds. One or two cubic meters of atmospheric gas were drawn through a 0.4μm-pore filter of ultrapure cellulose acetate. Gamma rays from the radioactive isotope Fe-55 were used to excite fluorescence in atoms in the range of 13 ≤ Z ≤ 25, and on Venera-12 a Cd-109 source excited heavier elements. Gas proportional counters were used to measure the energy of resulting x-ray emissions and return a series of spectra as material accumulated. On Venera-12, the device operated from an altitude of 64km to 49km, at which point the filter was destroyed by the increasing temperature. X-ray spectroscopy is imprecise about amounts of material, but it has yielded unique and important information about the Venusian clouds. The Vega probes revealed large amounts of phosphorus in the lower cloud layer, and am image is emerging about the structure of the clouds and why there are three layers. V.A. Krasnopol'skii has written extensively on the chemical and physical equilibrium of possible cloud systems, including the interaction of sulphuric acid, sulphur, phosphorus oxides, aluminum chloride and iron chloride. Heavy metal chlorides have low boiling points and are gaseous in the hot lower atmosphere of Venus. At higher altitudes, they may exist as crystals or dissolved in the sulphuric acid droplets of the clouds. Venera-13,14 and Vega-1,2 performed X-ray fluorescence spectralanalysis of the surface minerals on Venus. A drilling apparatus bore into the surface and a vacuum system transported the pulverized rock into an analysis chamber inside the pressure hull of the Venera lander. Venera-14 landed on a flat plain of rock believed to be a geologically recent lava flow, and its analysis showed minerals similar to terrestrial basalt. Venera-13 landed on a region of rolling hills, containing an unusual potassium-rich basalt. On Earth, alkali metals are more concentrated in granites or dissolved in ocean water, but Venus lacks water and may have a less differentiated crust. A number of Soviet descent vehicles have contained experiments to measure the electrical and mechanical properties of rock or soil. The tenacity of minerals can help identify their makeup. For example, the rock seen by Venera-14 appeared to be lava, but was actually somewhat crumbly like pumice. Soviet descent vehicles often carried dynamic penetrometers, which drove a conical sensor into the soil and sometimes attempted to rotate it, measuring the resistance or degree of motion. Penetrometers were a specialty of A.L. Kemurdzhian, who deployed physico-mechanical sensors on Luna-13, Lunokhod-1,2, Mars-2,3,6,7, Venera-11,12,13,14, Vega-1,2, Fobos lander/hopper, and the Marsokhod rover (a collaboration with NASA during the 1990s). 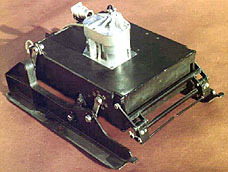 The Mars landers included a small mini rover, PROP-M, on a 15-meter tether, which ski-walked and avoided obstacles. It carried a conical penetrometer and a gamma-ray densitometer, which it was programmed to activate every 1.5 meters. Contact with Mars-3 was lost shortly after landing. Venera-11,12,13,14 and Vega-1,2 carried rotating conical penetrometers, PROP-V, that also performed electrical resistance measurements. On Venera-11 and 12, this device was damaged by the rough descent and landing. Venera-14's penetrometer landed inside the ejected lens cap, but it may have still penetrated the Venusian rock, instead of the cap. Venera-13 and 14 carried BISON-M accelerometers, which measured a high resolution profile of impact deceleration. This was stored in memory and transmitted after landing. The experiment was calibrated by drop testing the lander on a large variety of surfaces, and the results on Venus supported the finding that the surface was somewhat porous and crumbly. The first penetrometer experiment on Venus was the Venera-7 descent capsule itself. After its parachute failed, the probe landed at a considerable speed, but still survived and continued to transmit. From its doppler shift at the moment of impact, and from the fact that the probe was not destroyed, Soviet engineers determined that the surface was harder than sand but no harder than pumice. Many image are from NASA and come courtesy of their generous non-commercial usage policy. In particular, many are from the web site of David R. Williams, National Space Science Data Center, nssdc.gsfc.nasa.gov. The photographs of Sputnik-3 are courtesy of J. Porter Clark. Thanks to Andrew J. Ball and VNII TransMash for the image of PROP-V. The photograph of the Mars-5 polarimeter is courtesy of Audouin Dollfus. Special thanks to Vladimir Krasnopolskii, Vladimir Kurt for answering many questions about their onboard experiments.